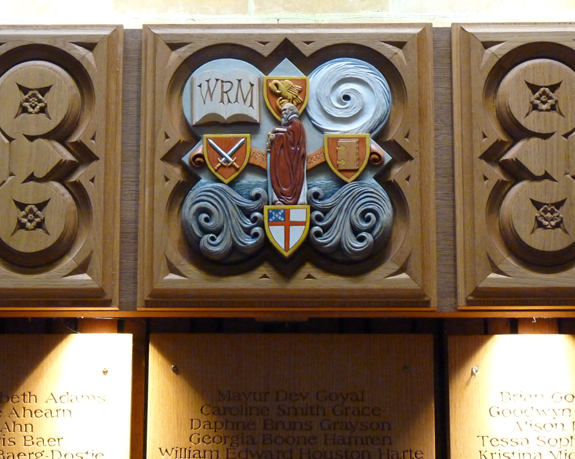 On June 2, 2012 the first group of the new Form plaques were dedicated in the Upper Dining Hall of Coit (New Upper). 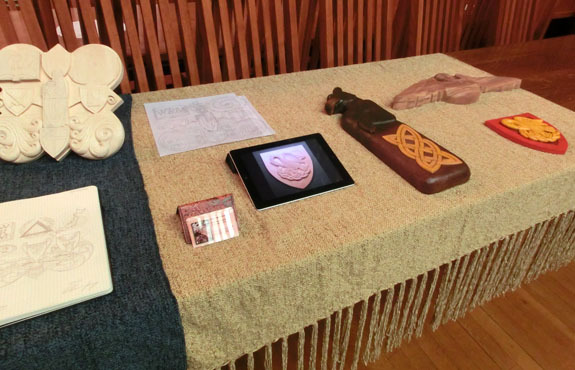 There was a small display of information about the plaques, the carving and design process, and the history of the plaques at SPS. A large group of members from the Form of 2012 were in attendance, excited to see the first new Form plaque in over twenty years. 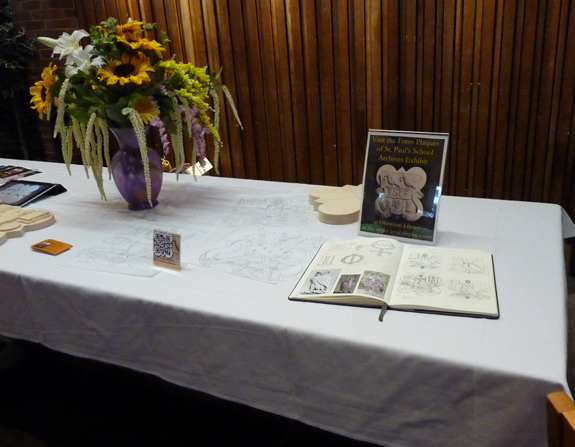 The display table featured information about the plaque project, drawings of the plaque designs, and the 1996 plaque in process. The sketchbook I use as part of the design process. These pages are for the 1996 plaque design. The 2011 plaque on display above the name plaques for the Form members. The 2006 plaque hanging above the name plaques for all the Form members. Read the Form Plaque descriptions here. Here is a photograph of the completed plaque for the Form of 2006. It is being dedicated on June 2, 2012 and hangs in the Middle Dining Hall of Coit (The Upper) above the panels that contain the names of all the members of the Form of 2006. Below the photo is the description of the elements incorporated in the plaque design. 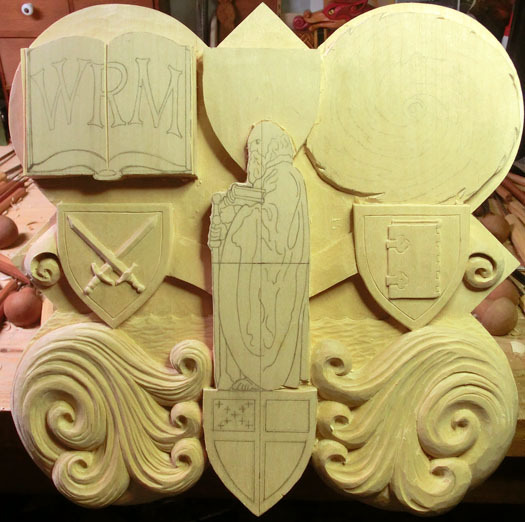 The central motif to the plaque is an adaptation of the SPS Sesquicentennial logo with St. Paul in the center surrounded by the four shields depicted in the logo -pelican, book, sword, and Episcopal shield. A scroll ties them together horizontally in the center with the dates: 1856 – 2006. 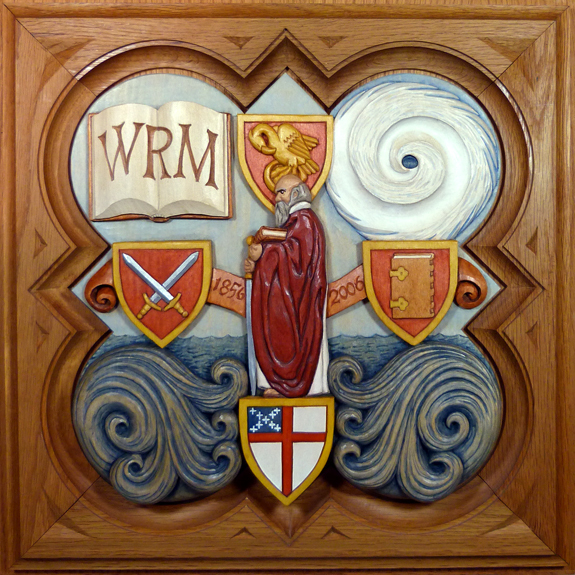 In the upper left of the plaque is an open book with the initials WRM which represents the beginning of Twelfth Rector William R. Matthews’ Rectorship. The book symbolizes the Rural Record, a journal of day-to-day life at SPS that was kept from 1857 up into the early 20th century. The upper right corner of the plaque is a carving of the spiral of the storm of Hurricane Katrina that devastated New Orleans and the Gulf Coast just prior to the beginning of the School year. The bottom corners of the plaque are carved with spiral waves representing the damaging waters of the flood in May of 2006 that resulted in the School closing three weeks early. 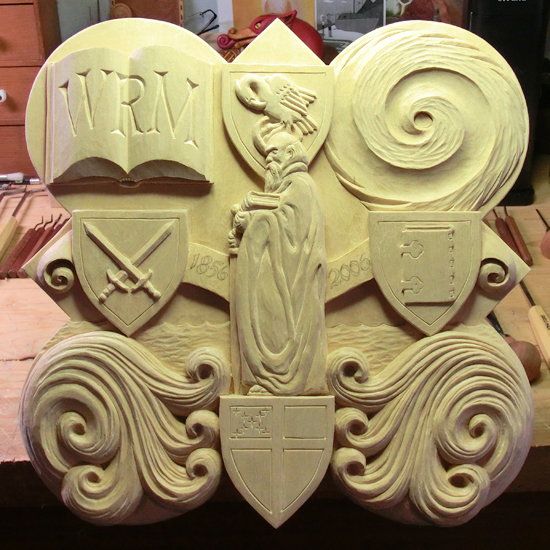 In the center is St. Paul himself, with the elements of the School shield separated around him. The upper left corner has the open book, commemorating the beginning of Mr. Matthews’ tenure as Rector. The spiral form in the upper right represents Hurricane Katrina. The Sesquicentennial dates are shown in pencil on the ribbon behind St. Paul and will be painted in as part of the finish. The detail above shows one of the waves created to represent the Mother’s Day flood of 2006. The Episcopal shield appears at the base as part of the Sesquicentennial logo. The next stage of the process involves sealing the wood and adding the painted finish. From here forward the project will go undercover: The completed plaque – with painted finish and mounted in its frame – will be kept a secret until it can be unveiled during the 2012 Anniversary Weekend celebration in June of 2012. Details to follow as we get closer to the date. I will now begin working on the 2001 and 1996 plaques, with plans to complete them both in time for Anniversary 2012. Progress on those plaques will be documented here as with the 2006 plaque, so check back often to see how things are progressing. 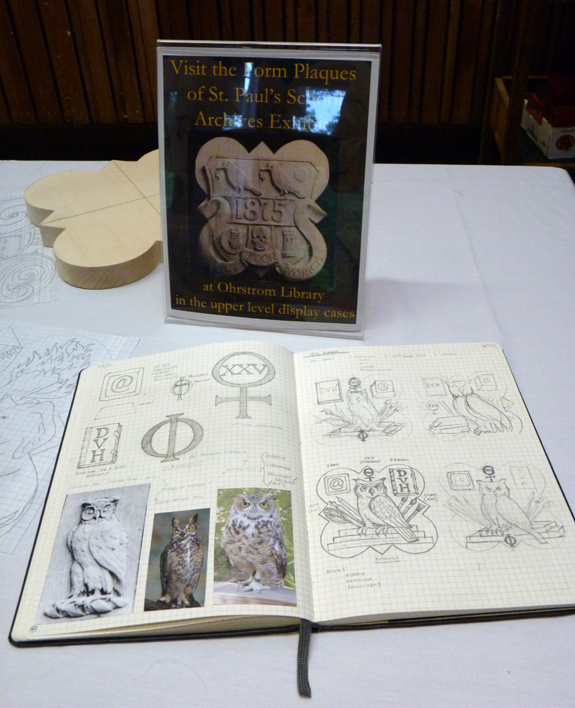 On October 1st during the SPS Alumni Volunteer Weekend I set up a display of the progress on the plaque project. The display was in the Upper Dining Hall and took place during the Saturday luncheon. 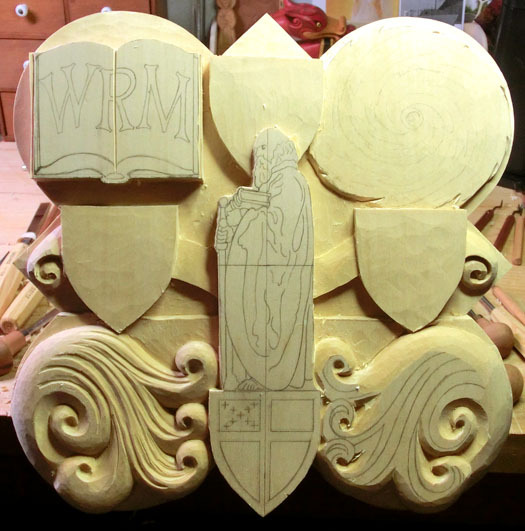 I displayed the completed carving for the 2011 Form Plaque (below, center) and the progress of the 2006 Form plaque, shown on the right. 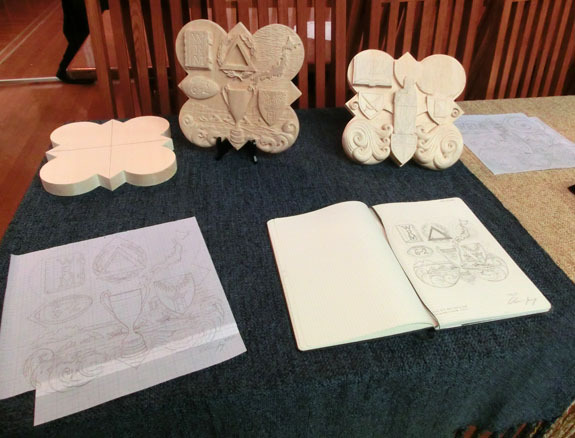 To the left is a rough carving blank – the form of the basswood when I start the carving process. On display in the front of the plaques in this photo is the design drawing for the 2011 plaque, and my design sketchbook open to the page of the 2/3rd scale concept drawing. 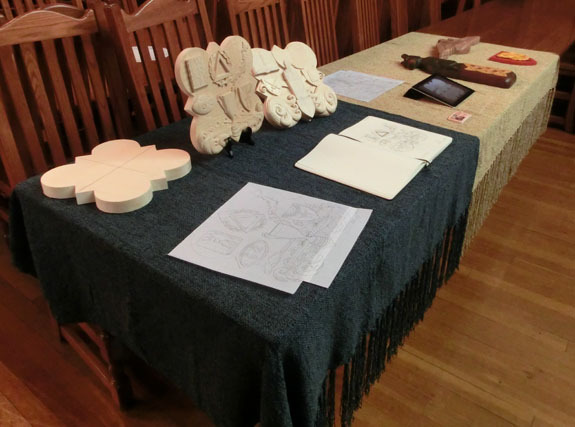 The second half of the display featured other examples of my carving work, including a carved bear with a Celtic knot motif, the SPS pelican shield, and the Spanish cedar carving in progress of a pelican on her nest. The luncheon event provided me with the opportunity to meet a number of representatives from the Forms in need of plaques and to introduce them to the process. I had a great time talking with everyone and answering questions about Form plaques past, present, and future. In this photo the spirals of the waves are nearly complete on the left, and the flood waters are visible behind St. Paul. The right side of the waves are beginning to take shape. 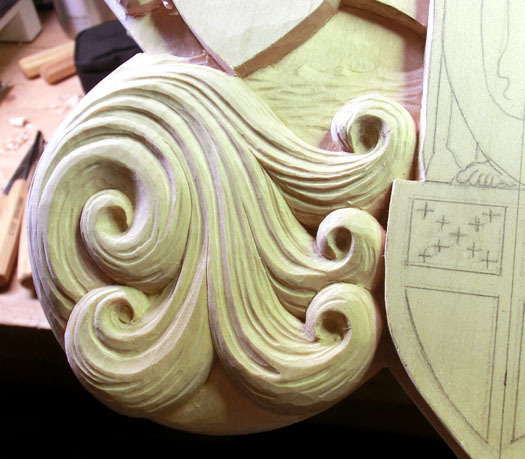 Here is a detail of the spiral waves – what was a simple design on paper has proved to be much more complicated thing to carve. I am pleased with the effect, especially when the shadows are picked up in the texture of the waves. 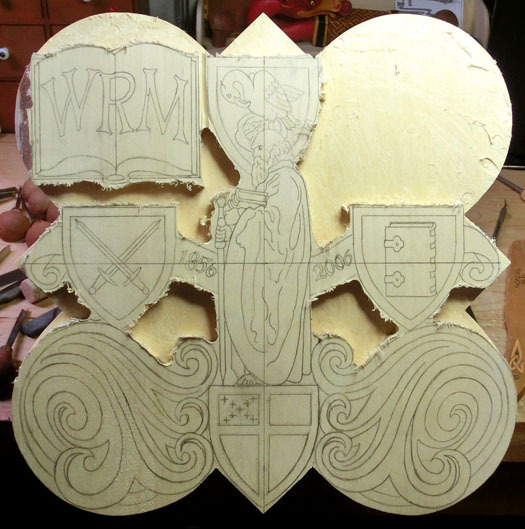 The details have been added for two of the shields from the sesquicentennial logo – each individual element of the School symbol will have its own shield, the crossed swords, the book, and the pelican. 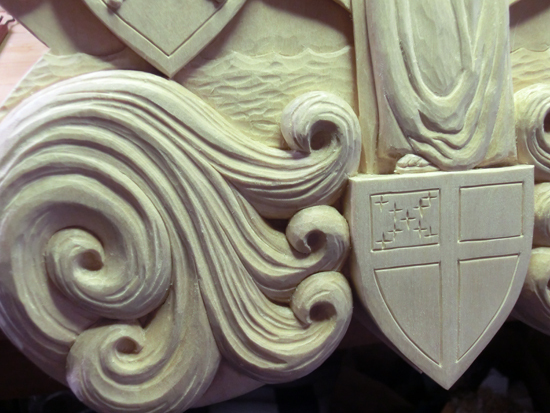 Here is another detail of the waves with the flood waters in the background and the sword shield above. 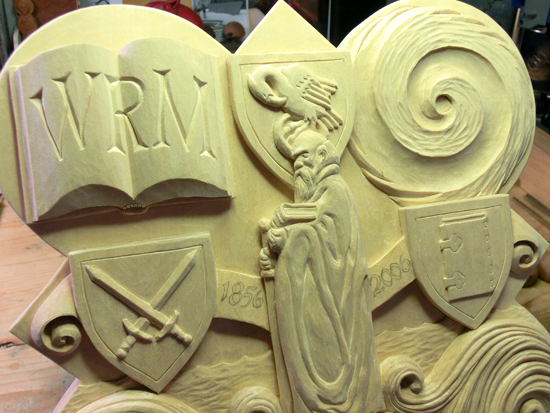 The scroll is still being worked on, and will have the sesquicentennial dates carved into the ribbon portion. This Saturday, October 1st, I will be setting up a display in the Upper Dining Hall for the Alumni Volunteer Weekend event. 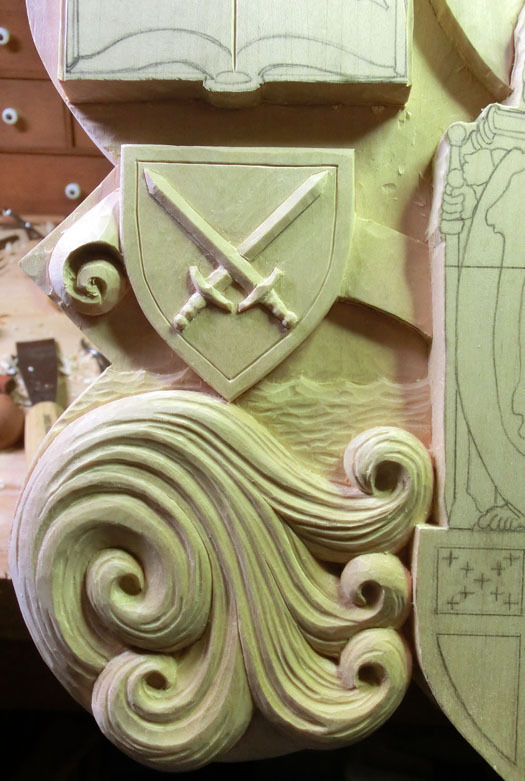 I will be displaying samples of my carving as well as the progress so far for the 2006 plaque. If you are an SPS Alum and will be attending the event be sure to stop by and see the display. This year I will work with the Student Council officers from the Form of 2012 to design and carve their plaque and to continue the Form plaue project forward. Additionally, there are twenty years of Form plaques that have not been carved preceding the recently completed 2011 plaque. The first of the missing plaques to be carved is for the Form of 2006, and following that will be the Form of 1996 plaque. 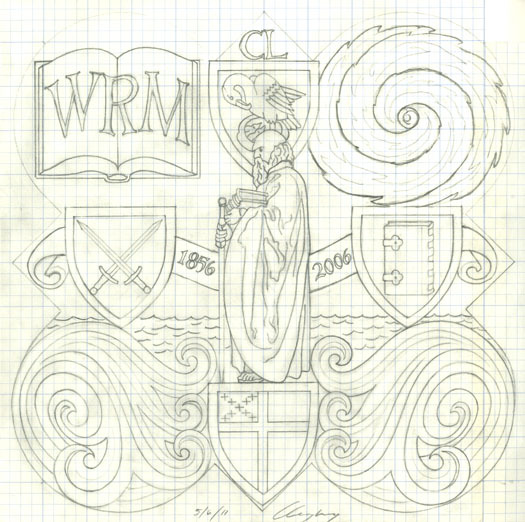 Central Motif: I have adapted the SPS Sesquicentennial logo design with St. Paul in the center surrounded by the four shields depicted in the logo (pelican, book, sword, Episcopal shield). A scroll ties them together horizontally in the center with the dates: 1856 – 2006. Upper Left: The book symbol represents the Rural Record, a diary of day-to-day School life that was kept from 1857 into the early twentieth century. William Matthews’s initials are incorporated on the pages of the open book, symbolizing the beginning of his Rectorship and representing the recording of the event of the change in leadership into School history. This first photo shows the plaque after the background level has be cleaned out using a router. You can still see the rough edges that are left from the router bit. This view shows the background after it has been cleaned up. 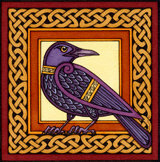 The edges between the elements are trimmed closely using a variety of shapes of carving tools and the background levels have been further defined. The spiral shape of the Hurricane Katrina symbol has been added. 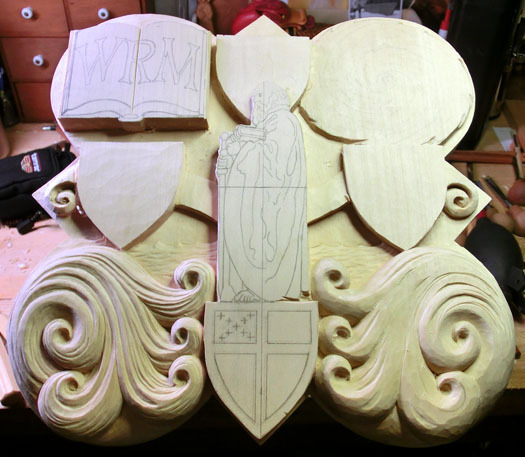 In this picture the scrolls are beginning to take shape, and the spirals of the water element are starting to emerge. 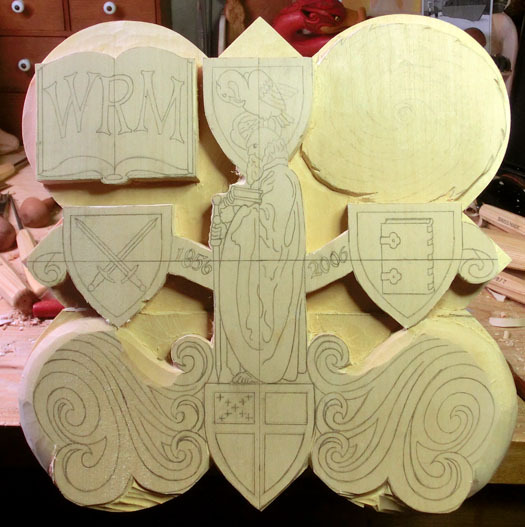 The shield shapes have been brought down to their levels and are ready to have the emblems carved into them. There will be more photos to follow as I progress – stay tuned!